On Friday night we had thirty-some people over to celebrate Soren's second birthday. The loosely interpreted theme was elephants - so I attempted to make an elephant cake. If you follow me on instagram you'll know that I had a little trouble with the cake mould, specifically the first attempt didn't come out of the pan in one piece. Luckily, round two worked a little better, and I managed to cover up any imperfections with copious amounts of icing. We served Soren's favourite food - hot dogs - alongside charcuterie skewers, coleslaw, spinach salad, baked brie with raspberry, popcorn, guacamole, veggies and dip, fruit skewers, and an assortment of pickles. For the first time that I can remember we went through basically ALL of the food. The party started at 6, so I assume most of the guests came straight from work - hungry. We've hosted quite a few parties but were surprised to see just how much food was eaten, as well as beer and wine consumed. I'm not complaining - I did not need a fridge full of leftovers! Our 1300 square foot house is a little small for thirty plus people, so we were really counting on good weather to take advantage of our outdoor living space. All day the skies had looked dark and stormy, but we took a chance and set up the bar outside, hoping it would encourage everyone to dine al fresco. It rained on and off for awhile, but our guests huddled under our umbrella and managed to stay mostly dry. We were lucky, and by 7pm or so the skies parted and we had decent weather for the next few hours. 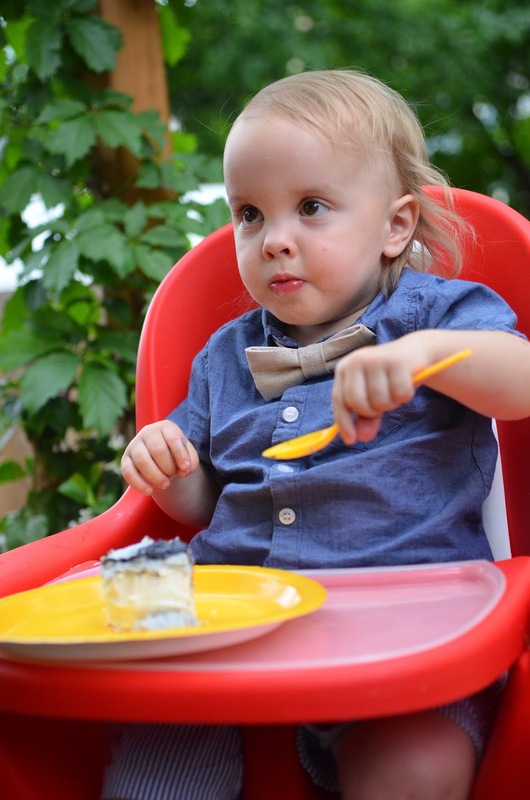 The birthday boy started off politely with a spoon, but soon realized his hands could get the cake to his mouth faster. We put the sugar-filled babe to bed just after eight, while the adult guests lingered until just after midnight. It was a lovely party - hopefully the first of many new deck parties! That bow tie is beyond cute! Great party - the new deck was the perfect party pad!